Potential routes abound when one is trying to raise money for a project. A sponsor's job is to work the numbers and find the ideal combination of financing sources. There are plenty of reasons why real estate investors might use “leverage” — other people’s money — to earn a higher return on their own investment. Investment property financing is tricky, but this post will help you navigate investing and the capital stack. Potential routes abound when one is trying to raise money for a project. The kind of money a sponsor or borrower gets might be as important as the total funding it’s able to line up — because different money means different things. 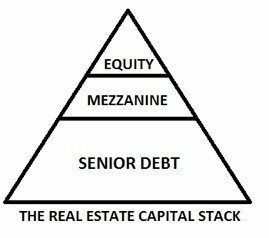 Real estate professionals speak in terms of the “capital stack.” This refers to the different layers of money and the various strings attached with each layer. Generally speaking, as one moves up the capital stack, one enters zones of increasingly higher risk — but also potentially higher rewards. The chart below indicates the three major layers of the stack — think of it as a money pyramid. Senior debt: This is the bank, or someone acting like the bank, who has to be paid back no matter what. If a borrower doesn’t keep up with payments, the lender will utilize the security interest that it likely demanded as a condition of making the loan — the mortgage — to foreclose on the property and essentially take away everything that the sponsor and borrower has worked for. Equity: This is the true ownership position. Owners get all the upside if the property appreciates in value, but also take the “first loss” if things go wrong. This could be the investor by himself or herself, or else he or she might try to syndicate — share — pieces of the equity piece with others. Mezzanine financing: This is an in-between space that can sometimes be pretty interesting for both sponsors and investors. Mezzanine financing is a kind of debt (though it’s often structured as preferred equity), but it comes in second after the senior loan. This position is a bit riskier for financiers to be in, but the return rates are generally higher to compensate for that risk. If the project looks promising enough, then the higher returns usually associated with this level of the capital stack might well be worth the increased risk. For active investors and sponsors looking to raise money for a real estate project, senior debt is the cheapest source of financing. Lenders here, however, will not only want the senior position on the mortgage but will usually only loan up to 60 to 70 percent of the property’s purchase price to give themselves a hefty cushion of equity or other financing positions that, in a downturn, will be hit first. This financing gets a sponsor a good portion of the way there, but the remaining amount of needed funds might still be too much for the sponsor to handle alone. Mezzanine financing might get a sponsor most of the way to the reminder of the money needed, but it’s usually more expensive than senior debt. Because it’s riskier for the financiers (closer to the top of the pyramid), and more likely to be adversely affected if the property’s value decreases, the interest rates will be higher. Nevertheless, if an investor would rather pay a fixed interest rate to an investor instead of giving up all of the project’s upside, then mezzanine financing can be a great way to go. The equity position keeps all of the project’s upside. Lenders and mezzanine financiers get their interest rates, but if the property has significantly appreciated, it’s the equity that reaps those (often greater) rewards. However, the equity also bears the first risk of loss. Oftentimes, even with the other financing raised, a sponsor might need some help at this level. The sponsor investor can turn to his friends and family to take a share of the project, or perhaps, turn to one of the other financing sources that have arisen recently. Each of these financing layers has different costs associated with it. It is the sponsor’s job to figure out the numbers, and to see which combination of financing sources might work best for the particular project. A sponsor’s job is to work the numbers and find the ideal combination of financing sources. Lawrence Fassler is the corporate counsel of RealtyShares, a leading online real estate marketplace. Should I buy an out-of-state investment property?